Heskin auctioneers brings this four bed detached bungalow to the market. 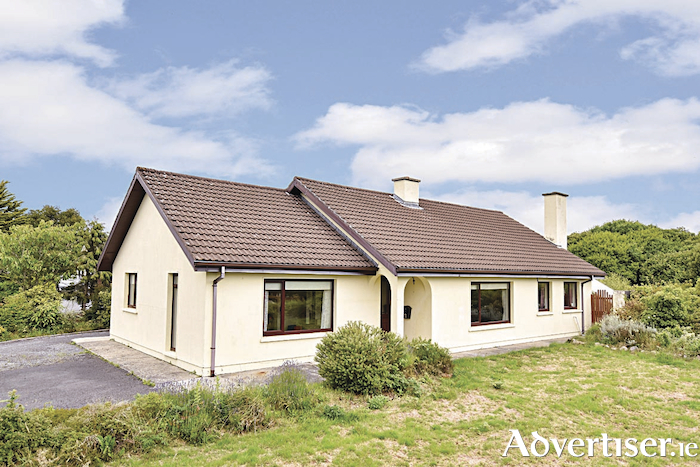 Situated in the tranquil townland of Doire Lochain Thoir (Derryloughane East ), Furbo, Co Galway, this property is just 15km from Galway city, 200 metres off the main Galway-Spiddal road (R336 ), past Padraicins Pub. It is close to Furbo village and beach. Spiddal village, with local shops and services including a hotel, bed and breakfasts, and craft village, is approximately 5km away. Built in 1976, this property is set on a half-acre site and measures 129.61sq m. It has double glazed PVC windows throughout and has oil fired central heating. Accommodation comprises an entrance hallway, sitting room, kitchen/living room/den, four double bedrooms, one of which is en suite, and main bathroom. There is a separate garage, laundry room, storage room, and sun room/potting room with access from the kitchen via a hallway and direct access from outside. The property further includes a greenhouse and a garden shed/office. This property offers any prospective purchaser an excellent opportunity to acquire a home in a quiet rural area with the chance to put their own stamp on both the house and the garden. Viewing is highly recommended and guaranteed not to disappoint. Guide price is €370,000. The BER is E1.